Following the launch of the Industrial Brand blog in 2004 we quickly realized that food and drink was so much a part of our lives it warranted the creation of a completely separate venue for the topic. Thus, in January 2005 we launched “In The Kitchen: Gastronomic adventures and insights from the minds at Industrial Brand Creative”. With a focus on food and dining in Vancouver, the blog also chronicled subjects of general food and cooking-related interest in both daily briefs and longer articles. Once we started inviting others from our peer group into the fold to write on the blog, over time it became apparent that it had outgrown its life as merely an extension of Industrial Brand. As such, we set out to create an new identity for the blog, one which would give it independence and more accurately reflect the vibe of its many contributors. The first task was to create a new name. Brainstorming with our core contributors many options emerged, some serious and others either hilarious or inappropriate since we wished to be regarded as a credible source of food and related information. 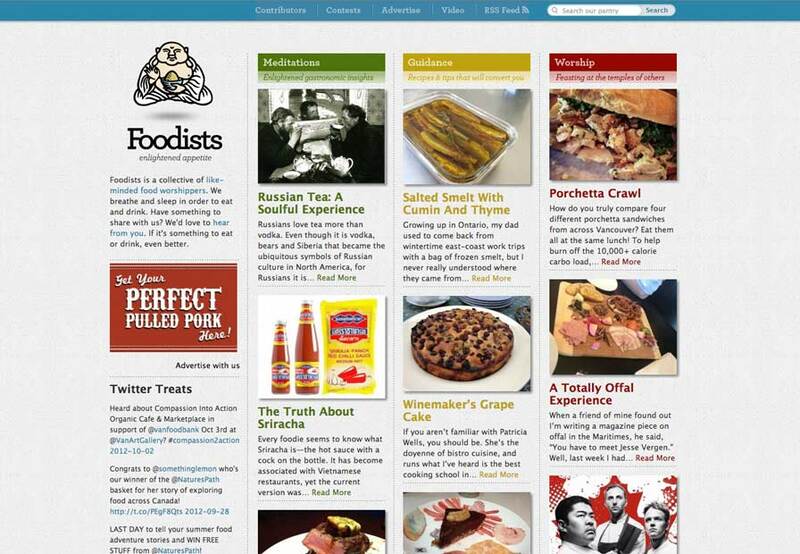 Having identified our key message as “We’re so passionate about food we worship it”, the name Foodists was decided upon. Foodists links our passion for food to something akin to the level of worship; it’s about our collective devotion to making, eating, enjoying, sharing and exploring good food and drink. 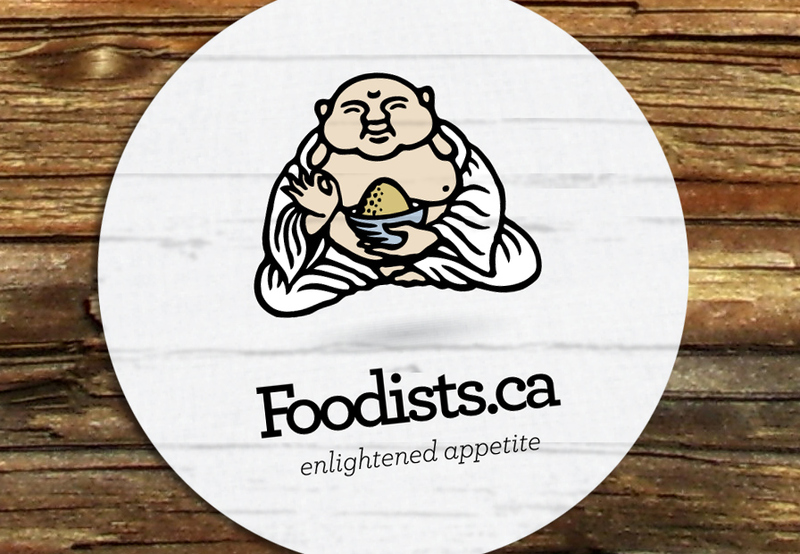 To accompany the new name we created a fun, friendly logo featuring a portly, smiling Buddah-like character so excited about food he’s levitating (who hasn’t had that feeling before, during or after an amazing meal?). 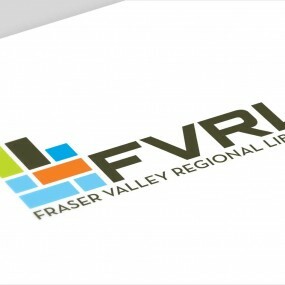 Rather than simply re-skin the existing build of the blog with our new identity, we recognized the potential to create a unique, functional, interesting design to impress readers, potential advertisers and food (and design) industry folks. The new design also allowed us to continue with the diverse range of content spanning new food discoveries, adventures, travel, products, reviews, recipies and more, and have it organized in a practical and engaging way. 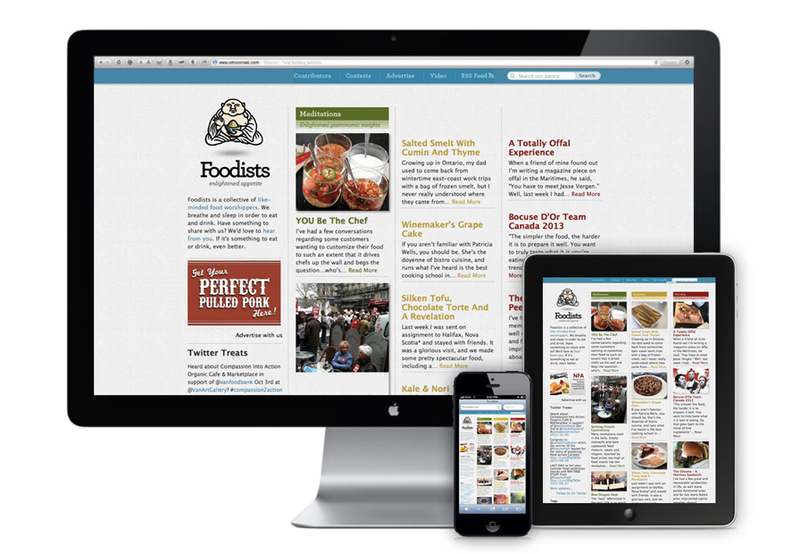 What has emerged is Foodists.ca, with its playful identity and simple, colourful layout designed to provide friendly appeal to a broad audience: like-minded, passionate food worshippers with enlightened appetites. Instead of opinions, the site offers “meditations”. Rather than recipes or tips, we share “guidance”. And, as opposed to the standard product or restaurant reviews, we celebrate our finds in the “worship” section. Posts have increased dramatically, as has the site’s audience. We are planning further updates and promotions, including our first contest/give away with a prominent cookbook publisher. Stay tuned. 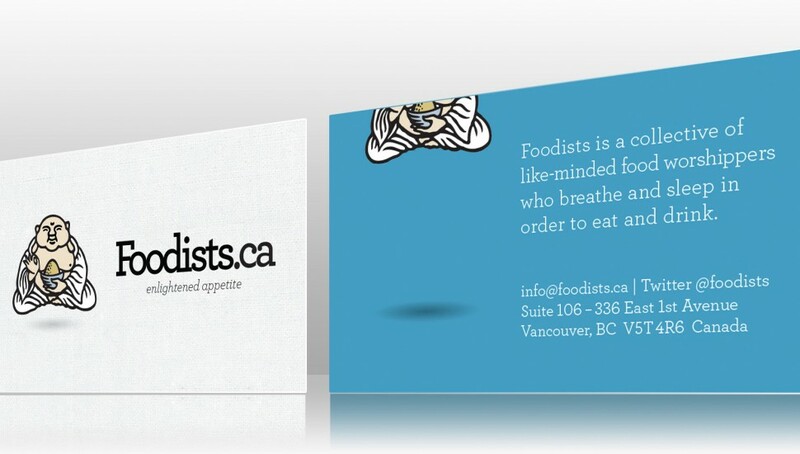 Launch website: www.foodists.ca or check out some of the videos we’ve produced.